Last week was my first experience trying out a few products from the Joan Collins Timeless Beauty range and I was very impressed by the quality. Instead of reviewing every product at once I thought I'd save the nail polish for today so I could give it some proper testing. 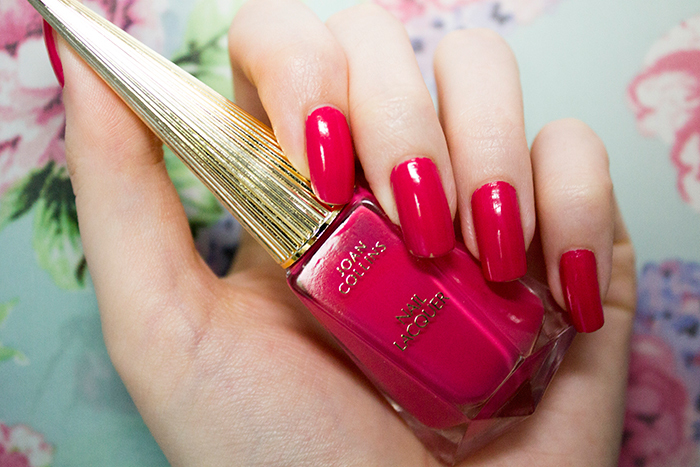 Here's the Joan Collins Beauty Nail Lacquer in Evelyn. Evelyn is a gorgeous fresh coral with a creamy/glossy finish. It's one of those shades that screams Summer and would be perfect for your holiday manicure. It comes in a beautiful art deco inspired bottle, though it's not all that practical for actual application purposes. The polish goes on quite thick so you do need to wait a little while for it to set. Personally it's not my favourite type of formula, I find it quite hard to work with as it's so thick but it's definitely not the worst. Once it sets, it's a completely smooth finish which I really liked. As for longevity, I found it pretty good to begin with but after a couple of days it did start to show signs of wear and chipping around the edges of the nail so I was a little disappointed in that aspect. Overall I love the colour and bottle design but as a practical polish, I think you can find better quality elsewhere.